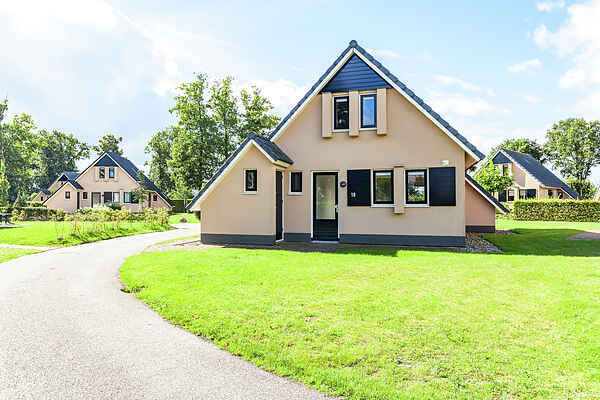 This detached holiday home lies at a ten minute walk from the forest, directly on the IJsselmeer lake. It's located in a small bungalow park in the village of Sondel. You can use the park's outdoor swimming pool. The house can accommodate six people. It has a sunny garden with patio and garden furniture. The ground floor has a cosy living room with sitting area and open kitchen. The bathroom with shower is also downstairs. There are three spacious bedrooms on the first floor. If you want to go on holiday with more people, you can also rent the house in combination with other houses in the park. Beach, lake and city centre (all 3 km) are all within easy reach. From your holiday home you can also make wonderful trips. The old fishing village of Lemmer (10km) and Stavoren (20km) are waiting to be discovered by you. Lemmer has a friendly water sports center and a beautiful beach on the IJsselmeer. This is where you'll find the biggest, still working steam pumping station in Europe. Stavoren, Friesland's oldest city, has a direct connection to the Frisian Lakes. Ideal for water sports enthusiasts! From Stavoren you can take the boat to Enkhuizen. A visit to the Zuiderzee Museum is certainly worthwhile.